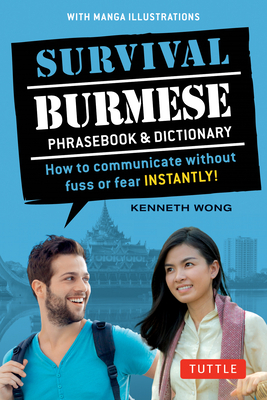 It contains all the necessary words and phrases for speaking Burmese in any setting. Perfect for students, tourists, or business people learning Burmese or traveling to Myanmar, it also contains a beginners guide to the Burmese language, allowing for a more in-depth understanding than a typical Burmese phrasebook or Burmese dictionary. The phrasebook is organized by situations where one might need to speak Burmese such as: at the hotel, in a taxi, using numbers, etc. Born and raised in Rangoon (Yangon), Burma (Myanmar), Kenneth Wong studied English at Rangoon University in the 1980s and bore witness to one of the seminal events of his generation--the 1988 student-led uprising against the country's military regime. He immigrated to the U.S. in 1989. Wong is the author of A Prayer for Burma, a travelogue and memoir about growing up under military rule. His short stories, articles, and essays have appeared in Myanmar Times, Irrawaddy, San Francisco Chronicle, AGNI, and Grain magazines, among others. He discusses, translates, and shares the rich literary tradition of his homeland in his personal blog. He has contributed Burmese poetry translations to Eleven Eleven and Wolf magazines.